Customer Empathy will be well-known to anyone who has heard about design thinking. So too, for that matter, anyone who has attended an Ag Innovations Bootcamp. Customer empathy is fundamental to creating great design that meets people’s needs. So how do you do it? Often “customer empathy” can sound a bit soft and “fluffy”; and rural professionals won’t want us to “empathise” with them, will they? It’s easy for us to mistake empathy for sympathy. Both words involve understanding. Sympathy involves understanding emotional or physical hardships, and then offering comfort and assurance. Empathy builds personal understanding of what others are feeling, and the ability to put yourself “in their shoes”. Design practitioners we work with exhibit a similarity – they cultivate a “relentless curiosity”. You’ve experienced this yourself, with someone who took a deep and genuine interest in your work or hobby. They listened attentively and asked thoughtful follow-up questions. They made you feel as though you were the most interesting person on earth! Too often, when we venture into the field to talk to customers, we try to validate our own thoughts. We are the experts. We ask questions to qualify the customer, and to quantify the value that our solution will offer. But what if our intended solution is not what the customer needs? What if there is an opportunity for something even better and more interesting? Prepared questions will help you start a conversation. Deep listening and genuine curiosity will help us learn more than we could imagine. How many customers do you need to interview? Will one or two be enough? It would be nice to think so. Interviews take time to arrange. They take a lot of time and energy to carry out, and they often involve much travel. You can’t usually interview agricultural workers on a city street with a clipboard. If you interview too few people, it can be hard to distinguish the important from the frustration of the hour. We know that diversity is an essential to high performing teams and great decisions. Seeking diverse views will also help you to create better products or services. Plan for at least five interviews. You should find both commonality and the breadth of variation between your interviewees. If you’re finding great diversity (or your first interviews don’t fit your early adopter profile), you may need to find more. If you need to interview that many, should you consider a focus group instead? Could you get a group of customers in a room or on a Skype call and make more progress? Focus groups have a different dynamic to one-on-one discussions. They good for uncovering trends and areas of concern. Detailed insights into the jobs your customers are trying to do are less likely to surface. Will all users share their experiences and frustrations in a focus group? You may only hear personal experiences from the extroverts. There’s also the risk of “group think”. People may agree with well-expressed comments from others, regardless of their personal experience. Make the effort to interview customers as individuals, or at most in twos. In our experience, there is some value in bringing farmers or rural professionals into a meeting room or board room. They are less prone to interruption, and you have more wall space for Post-It notes and diagrams. Yet you miss seeing the actual environment where they work and will use your product or service. You may also miss the environmental influences that affect the tasks they are trying to do. Being on the farm or in the customer’s work environment allows them to pick up equipment and show you how they use it. They can point and describe the flow of animals, the pressure of people and machines. You can observe the frustration of sunlight on displays. Most important: when you bring an end user into the boardroom, they become an amateur designer. This might be valuable, but it also becomes easier to talk in general terms. You may map general processes and forget to delve into experience. Go to where your customers and end users work. You’ll gain richer insights and higher fidelity than you ever could in the boardroom. One of the questions I am often asked is: “How does farming in NZ compare with the UK”? Right now I think it’s a slightly loaded question with all the Brexit talk – subsidies and all that. But in reality given the context of the question is usually in the knowledge I head up a UK-based subsidiary of an NZ agri-software business, what many are really asking is: “How will technology change what we are doing, and is NZ ahead of the UK”? Now this is a harder question to answer. I guess at a high level I would say adoption of technology in the NZ dairy sector is some years ahead of the UK, but equally, there are big advances in UK arable and hort which one might say are further ahead than NZ. One thing I would say is that NZ farmers are, more typically, open to change and innovation and less wedded to the way it is. But I think there is something bigger going on than simply comparing one country with another. Sure NZ is a focus for our sector just now because of the way it has, in a generation, turned itself into a very globally focused and innovative economy; one that tops the global rankings for ease of doing business (and one that I would say punches well above its weight, and that’s not just the All Blacks!). No. I think we are witnessing the early stages of an utterly transformative period in global agriculture. And that’s why I ask the question: “Do we really know what’s coming?” By this I mean, how is technology (and maybe digital and data in particular) going to change the sector? In short, from where I sit, I would say those of us in the tech world do have a good hunch about what’s coming and the potential impact it will have. But I am not at all convinced the “average farmer” (which is a horrid term) does. To me it is inconceivable that a farming business (whether in the UK or elsewhere) will be in any way competitive without the use of data-driven decision support tools in the future. The level of accuracy and objectivity that data will deliver (and we are seeing this already) simply puts subjective observation in the second tier of good decision making. That isn’t to say good husbandry and farming experience have no place in the future (of course they do – I know some brilliant, intuitive and innovative farmers) but those who apply that experience with the latest technological tools will become the Premier League while others languish in the lower divisions. Give me an example I hear you cry? Ok! A couple of weeks ago I sat down with the CEO of an innovative dairy cow data capture company (based in the UK) that is effectively putting Fitbits on cows. The volumes of behavioural data they are collecting from those animals is now substantial. But it’s what they are doing with it that so impressed me. By using clever algorithms to understand normal and outlier behaviour of animals they are achieving two great things. The first is the ability to provide alerts flagging animals that are not exhibiting typical behaviour. In other words, “go look at those ones, that’s where you should prioritise your time”. But the second is what really excites me. Who’d have thought that by analysing cow behaviour data it would be possible to identify lameness, mastitis and other disorders days (even weeks) ahead of when the clinical signs might be observed? I don’t care if you are the best herdsman in the world, it is hard to compete with decision support from data that is identifying things well before they are ever observable by the human eye. This “power” has the potential to transform the way we run our farms. The application of digital technology will not only potentially save time and labour, it will enable better focus on meeting market requirements, predicting and avoiding problems, and increasingly importantly, be able to provide a substantial evidence base to back and improve welfare standards and all sorts of other production areas currently under scrutiny. But this future is a far cry from where many on our farms sit currently. Sure there are those that are the early adopters, but I think there is a large majority who simply don’t see this massive change coming, or if they do are in denial. There are many analogies over the years of where technological change has been transformative and where at the time many did not see it coming: Henry Ford and so on. But it’s the sheer scale of change from tech-driven ag that I think we underestimate at our peril. The upside is that all this talk of agriculture being a high-tech industry that our children and students should be enthused about is not just talk. It is absolutely true. The more we can find demonstrable examples of great (even cool) innovation, the better it will be for our farming sector, not only because we can farm better, but because we can also excite the right people into the industry. In my 25-plus years in the ag world in the UK and NZ, never have I felt there is a better time and more opportunity for non-farming people to get involved in the industry, whether that’s in agribusiness, science or on the farm. And if, as I suspect, we see a reasonably aggressive scaling back of direct farm support in the UK (assuming we Brexit! ), that could open the door to a new generation of tech-driven farmers, unencumbered by the past and able to deliver from the potential of the land and associated technology alone. They will be the new competition. Can’t see it coming? The iPhone is only a little over 10 years old. Things will look very different a decade from now in agriculture. That’s really not very far away. Are you on the train or is it leaving without you? We recently attended and exhibited at EvokeAg, the new agrifood international technology event specifically for the food and farming community hosted by AgriFutures Australia. EvokeAg brought together more than 1100 attendees from across the Australian and wider agriculture and agritech industries, including 100+ attendees from New Zealand and a substantial contingent from Israel. The event featured over 100 speakers from 20 countries, but importantly there was opportunity for all participants to share and be involved. Data collection, analysis, and the application of artificial intelligence. Comments like “Data is the new gold” abounded. I’m not personally sure that data is the new gold. I think data is more like an ore that needs to be mined, processed, and refined to extract the real gold. Or maybe data is more like electricity – its intrinsic value is established from use, rather than collection. Research and development organisations and funders. A particular genius of this event was the way that conversations and interactions were facilitated. Braindates, facilitated by an app for discovery and bookings, brought together participants with shared interests, making it easy for those who did not know each other to connect. Careful layout of the food stations, with plenty of tables, seats and leaners for eating encouraged fortuitous conversations, as did the set of food trucks outside providing lunch and evening food around a grassy courtyard. A good blend of exhibitors, lounges, and a “start-up alley” encouraged attendees to look around and interact. Brad and I nearly lost count of the number of people who stopped by the Rezare Systems stand, took a seat and had a relaxed discussion. The challenge for AgriFutures (the organisers of EvokeAg) and the wider industry is how to capitalise on the positive ecosystem effects to drive growth and innovation. The #growAg initiative announced at the conference, along with AusTrade’s Agriculture 4.0 focus should make a big difference. We’ll play our own part as well – continuing the conversations with those who met with us, and offering an Ag Innovations Bootcamp in early June, an in-depth workshop on design and customer engagement in agriculture, suitable for both start-ups and established Australian agribusinesses looking to innovate. Confession time. It was with more-than-a-little nervousness that I arrived to Rezare Systems’ Ag Innovations Bootcamp at Mystery Creek in December. I wasn’t nervous about the content – as a facilitator I had guided and coached many teams through design thinking and innovation experiences. I wasn’t nervous about the size of the group – Rezare had done a masterful job of curating an experience to 20 people, allowing for much more tailored learning and personal interactions with everyone in the room. I was nervous because I had never worked in this way with agricultural innovators, farm specialists and primary sector entrepreneurs before – and I wondered how they would engage with new processes and learnings designed to help them create new solutions that solve real problems. I shouldn’t have been afraid. Within moments of my arrival, I recognised that Rezare had created an experience that encouraged all participants to embrace this new process, to voice any questions and concerns they had, and to lean into the uncertainty they may be feeling. The Ag Innovations Bootcamp was created by Rezare as they recognised the need for upskilling and supporting agricultural innovators and businesses who were developing new and improved products and services for the market. These businesses were highly capable in their technological skills and knowledge of the market – but many did not know how to deeply understand the customer problem to be solved, or ways to rapidly co-create with their customer, generating new insights and better-fit final products. Motivated by this need, Rezare decided to practise what they preached. Billed as a prototype event, the Ag Innovations Bootcamp provided a bespoke learning experience, with participants being guided through LEAN business model canvases and how to apply these to new concepts, approaches in ideation and brainstorming, powerful empathy techniques, and hands-on experience in rapid prototyping. The two-day event was jam-packed with practical learning, but also invited feedback and iteration from the participants – so they could see how even the Bootcamp was a design-driven event. Each aspect of Bootcamp was planned for the needs of the participants, who Rezare had identified as ranging from entrepreneurs seeking to develop their agricultural product, through to business managers from rural agencies and large-scale agribusinesses. All participants shared a common drive – a willingness to be creating new solutions that will benefit farmers, orchardists and primary industry producers around the world. As a design thinking facilitator, I’m increasingly aware of the critical need for innovators and managers to upskill in this area. McKinsey reports that businesses that embrace human-centred design and co-creation provide 32% higher revenue growth than non-design led businesses, and 56% higher return to shareholders. At the same time – over 40% of companies don’t talk to their customers at all during product and service design – a trend which is likely higher in New Zealand. In our world of rapid change, developing trends and lower development costs, it is imperative that innovators learn to co-create with their customers and solve their real problems. This is the heart-beat behind Ag Innovation Bootcamp – and a growing need in many businesses. Over the two days, our Ag Innovations Bootcamp participants learned the theory of design thinking and engaged with case-studies of design thinking challenges – but the true growth came from the design experience curated for them. Small start-up teams were formed amongst the participants, who were tasked with a design challenge – and then coached throughout a design sprint. It was immensely encouraging to see all of the participants crafting discussion guides, running empathy interviews with real customers, capturing key insights, clustering new concepts and discoveries, generating 100s of potential solutions, and prototyping an idea for testing – all within a fast-paced, supportive environment. There was plenty of laughter, questions and debate throughout the two days, which was encouraged by Rezare and all the facilitators. Additionally – participants were provided with breaks from doing, to learn from experienced innovators from Gallagher, Amazon, New Zealand Trade & Enterprise and more. At the end of Ag Innovations Bootcamp, I was not driving away with nerves, but with excitement. I was deeply encouraged by how much the participants had embraced the learning, and created concrete lessons that they were looking forward to applying in their business. I enjoyed seeing moments of discovery for all of us, and a recognition from participants that they could do this – that they could begin talking to customers, generating insights and designing quality solutions to real problems. I was motivated that it was through the unique combination of listening and doing, that Rezare had crafted an event that really did maximise the learning for all who attended. And I was encouraged to learn that this would not be the last – but that Rezare Systems would continue to iterate the Ag Innovations Bootcamp, to keep supporting and guiding innovators towards both business and product success. We often discuss approaches to building customer empathy and validating product design, for example when we are helping our own customers or in events such as Ag Innovations Bootcamp. One of the recurring questions is “are we working or testing with the right customers?” Often the answer is a clear “yes”, but not always. The cost to a business of developing an innovation based on feedback from the wrong customer can be enormous. If you develop products or services for the agricultural sector, it is worth revisiting how you identify and choose your early customers. At first glance, early customers are only those who first discover and adopt your service. But it’s often not that simple. They may arrive through your network. They may be hard-won with shoe leather, or by “growth hacking” your value proposition. Great product design comes from customer empathy. You build a deep understanding of your customer’s context, goals and needs. You must understand the real problem you are trying to solve for the customer, and its value to them. You test your product or service prototypes with your early customers. These may be deliberate prototypes or your first MVP (Minimum Viable Product) release. Early customers show traction. Your investors or your organisation look to adoption as proof of a viable business model. Who are my early adopters? Everett Rogers coined the term in his book The Diffusion of Innovations (1962). His theory about adoption of innovation used the results of 508 sociology studies. Much of the early work on diffusion focused on agricultural technology in the 1920s and ’30s. This was a time of widespread innovation in genetics and mechanisation. Innovators: willing to take a risk on innovation for its own sake. Early adopters: adopt technology that solves problems and provides status. 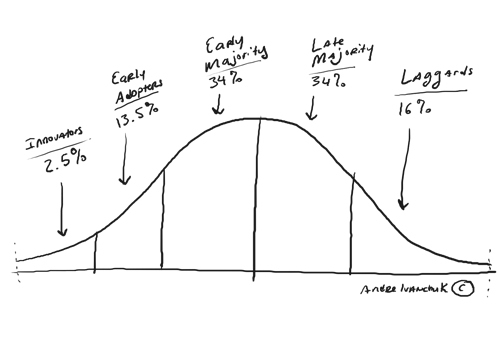 Early majority: influenced by early adopters, they wait to adopt useful and valuable innovation. Late adopters: with some scepticism adopt after the majority. Laggards: see no value in change. These are often seen in the diagram made popular in Geoffrey Moore’s Crossing the Chasm (1991). The percentages shown may not quite match your market, but studies show the shape of the curve and overall proportions generally apply. Early adopters must be the initial target. Innovators love innovation for its own sake. They don’t represent the problems and needs of your larger market. You will end up solving the wrong problems. The early majority await evidence of success from early adopters. We like the way that Justin Wilcox defines early adopters in the light of the problem you are trying to solve (Focus Framework, 2016). It’s a practical way to think about what makes your early adopters distinctive. Laggards Don’t have the problem you are trying to solve. Late majority Have the problem, but don’t know it yet. Early majority Have the problem, and know they have the problem, but are not yet paying to solve the problem. Early adopters Have the problem, know they have the problem, and are already paying to solve the problem. “Paying” to solve the problem doesn’t mean they are buying another product or service. They may be investing time or effort. They may be hiring staff or using a consultant. They may be “making do” or “using number 8 wire” (as we say in New Zealand). What techniques might your early adopters be using to solve the problem? Those very techniques might be the indicators that help you identify the customers. As early adopters know they have the problem and are trying to solve it, they may respond to an appropriate call to action. You might test if you can position your solution in a way that early adopters will recognise and respond. Listen online: Tune into farming-oriented groups in Facebook or hashtags on Twitter. The best Facebook farming groups are often closed – you need to be a farmer or show you won’t spam the group to join. Use these groups to understand interests, events, and to ask good questions. Build your network: Create a diverse network of rural professionals, influencers, and others. Make sure you help others and give as well as take. Members of your network will help you meet potential early adopters. Hit the road: Attend the events that your early adopters are also likely to attend. There are many farming-focused events, conferences, and field days. Going along to listen and learn at farm open days is a great way to meet others. Learn the language: Agriculturalists I know are willing to speak with anyone trying to improve farming’s lot. Listen to them to build the language and questions that will help you influence customers. Is this the year you take your agribusiness digital? It’s the time of year when people of all backgrounds make new year resolutions, institute new habits and reflect on their journey. It’s not uncommon for business leaders too, to reflect on business performance and goals for the future. Are you ready to take your agribusiness digital? You’re thinking that your business is already digital. You have an ERP and a CRM, a web site and a mobile app. Your IT team has already virtualised your core business systems. What else is there? You already use technology in your business. You may even use it well, though many agribusinesses are saddled with 10 to 15-year-old software and significant “technical debt” that acts as a drag on business agility. Taking your agribusiness digital however, implies something more significant: transformation. Most agriculture and food businesses, rural supply, and advisory businesses have grown over many years, starting life and establishing business models well before the connectivity, data flows and analysis of today were envisaged. Would your business look the same if it were started today? With the internet and mobility connecting most people on the planet (and likely your customers), how could your business leverage technology to substantially change how you engage with your customers, streamlining their experiences and introducing greater perceived value? Dominos’ Pizza (DXP) and Papa John’s Pizzas (PZZA) both had a market cap of around US $600M at the start of 2010. Both companies still sell pizzas with take-out and delivery options. Dominos invested early and continuously in technology innovation for customer engagement, radically changing the way that pizza is ordered, and delivery is tracked. The value proposition for customers was a different, improved, and easier experience in ordering pizza. A benefit for Dominos was an increase in average order value and a massive switch from phone to internet orders. Arguably, Dominos has set the customer engagement bar that other pizza franchises have followed, and in the process grown its market cap to over US $12B, while Papa John’s followed incrementally, and has grown to US $3B. What transformative opportunities could your business leverage by effectively connecting its digital information with suppliers and supply-chain partners? Common data standards, APIs, principled and secure sharing of data open the way for you and your partners to gain new insights and radically change business logistics. Seven of the top 12 largest companies in the world by market capitalisation: Alibaba, Alphabet (Google), Amazon, Apple, Facebook, Microsoft, and Tencent – are ecosystem players, sharing data and common services with their supply chains and partners. At least one of those companies may have been too connected on occasion! We recommend principled and secure sharing. Newspaper “The Guardian” developed its open platform in 2009 and has been evolving it ever since. The platform provides APIs for developers and for partners. Many sites and mobile services use the Guardian API to deliver timely news, and the Guardian benefits with referrals, ad placements, and the ability to understand how and when people consume its content. Partner integrations allow the Guardian to crowd-source additional data for its services (such as location tagging), and to position its brand beside influential partners. Many of our agricultural and service businesses, or their forerunners, started life 80 or 100 years ago. The fundamentals remain, but models of communication and distribution, use of information and analysis have all changed dramatically. Our business models – how we create and monetise value – have changed more incrementally. Digital transformation offers agricultural sector businesses the opportunity to reframe their business models for the new and evolving business environment. Ford has started to redefine itself as “a mobility company and not just as a car or truck manufacturer”. GE is seeking to make analytics the new “core to the company”. Certainly, if you were starting a personal transport company today in the face of Uber and Lyft, it would not look like an existing taxi company. How might your business leverage technology and connectedness to create value in different ways? Considering your digital agribusiness options for 2019? Contact us for a free initial discussion. Consider using one of our digital agriculture strategists, Andrew Cooke or Julian Gairdner to facilitate a workshop our help with your thinking. You’re creating the future: a product or service that does not yet exist. How do you ensure your team is on the same page? Do you tell them how they will build it? How it will work? Or do you paint the picture of how it will make people’s lives better? Your investors and partners are the same. Your product vision is the core of your business vision, so you want key people to understand and love it. Still, formalising your product vision seems like another chore in your busy schedule. You might even fear your idea will lose some of its magic in the harsh light of the day. Helps you communicate the vision to your team, your partners, and potential investors. You can be confident that you’ve passed on the key elements and not missed anything out. Inspires others! People who believe and buy-in to your vision will go above and beyond the call of duty to make it a reality. Here are three keys to get you started on composing your agricultural product vision. Identify who your intended users are and are not. What problems will you solve for them? How much do those problems matter to your intended users? Are you tackling their problems or forcing your own solution? The Einstellung Effect is a psychological term. It describes how we can fall in to the trap of applying a familiar approach or solution to problems. When all we have is a hammer, everything looks like a nail. This is a great reminder to us to fall in love with problems, not our solutions. Your agritech product vision should describe the problems you want to solve. The eventual picture is larger than your first release. Think about what your vision looks like over the next three, five, or even ten years. At the same time, your first product release (or releases) don’t need to fulfil the entire vision. Break the plan into bite-size chunks that you can achieve and learn from them on the way. Take a view about the way we will solve problems in two to five years. You’re creating the future, so yesterday’s rules may not apply. I’m not suggesting divorce from reality. Ensure you have time and space to read, research, and test. Seek to understand how people might work in the future, and how your product might contribute. If your product is a service (to some extent all are), how might it fit with the ways your users want to communicate? Your product vision is not a product specification. It’s not an elevator pitch either. Whether it is a story or bullets in a slide deck, it’s the way you bring your team and partners with you on the journey. It should help them pull together and solve the problems that count. As your Agritech product vision evolves, there is one more thing to do: communicate relentlessly. Share your vision with your team and your partners. Evolve it based on what you learn. Things are coming together for the Ag Innovations Bootcamp (5-6 Dec, Mystery creek, Hamilton). Jenene Crossan – The brilliant digital entrepreneur behind some of new Zealand’s most recognisable digital brands, including nzgirl.co.nz and her latest project Flossie. And now announcing facilitator and creative coach Jeremy Suisted. Jeremy is founder and director of Creativate, an innovation consultancy and is a passionate and driven communication expert who can turn any endeavour into a success. Don’t miss out on these incredible speakers and this enlightening experience! Do you have an idea for what could be the next great agricultural or ag-tech product or service? Looking for ways to reliably convert ideas and concepts into products or services that meet the real needs of the market and your business? Hosted by NZ National Fieldays and Rezare Systems, with our partners Amazon Web Services and AGMARDT, Ag Innovations Bootcamp is packed with inspiring speakers, case studies from other product managers, hands-on learning and networking opportunities. You’ll learn techniques you can apply to build and validate business cases, understand user needs, and construct lightweight prototypes. The early-bird offer for Ag Innovation Bootcamp runs until 9th November 2018. Why are relatively few agritech products achieving adoption at scale when billions of dollars are being invested internationally every year? New start-ups appear almost weekly. And established companies are shifting from small innovations around the edges to major projects that sit at the heart of business plans. Yet for all this activity, few product ideas seemingly “make it”. We work with many agricultural companies – start-ups and established organisations – to help them develop smart digital products and services. In our experience, there’s a strong correlation between a business’s approach to product management, and their success in developing meaningful products or services that get used. The choice of product manager, the scope and objectives of their role, and their level of skill and authority, drives the success (or otherwise) of the product or service development. The CEO or a Project Sponsor may define the overall business outcomes and vision, and project managers may be concerned with product budget and timeline, but the product manager is at once the “voice of the product” to the business, and simultaneously translates the “voice of the customer” to the development team (this part of the role is also called product owner). They decide the detailed problems the team will try to solve, the relative priority of those problems, and when the solution is complete enough to be put into the hands of customers. A product manager juggles many tasks. They must understand scope, be able to prioritise effectively, understand how the team is delivering and what is planned. It’s incredibly hard to do this if the product only gets a small time-slice of your attention. You won’t be able to effectively manage your product by turning up for a fortnightly sprint planning session. Product managers need to be able to spend time with both stakeholders and the development team. They participate in customer interviews, review the product in showcases put on by the development team, and are deeply involved in product planning workshops. Does this product solve a real problem for its users, and can they readily get the benefits? Are customers willing to pay for a solution, and is this solution sufficiently “better” that they will switch? Does this product or service meet the objectives and fit the strategic direction of the company? Is there a business model that makes sense for the company and which could be profitable? Can it be built to operate as envisioned, at a cost the company can justify? Effective product managers really understand the needs of their users and customers – their behaviours and the problems the product is trying to solve. They use observation and interviews to inform their opinions and seek data from the existing tools or products that customers use. Product managers must also build trust with the business, effectively communicating how the direction and priorities chosen for the product meet the objectives of the business. It’s very tempting to build technology products and services the way corporate computer systems were developed in the past: envisage a solution, document it as a set of requirements, and set the development team to work. When the developers and testers are done, roll out the solution (or pass it through to sales and marketing). Effective product managers know that detailed customer needs are emergent, and so too must be the solution to those needs. They make use of product discovery activities: carrying out interviews, running experiments, and building prototypes. They know that testing an idea by building a prototype and validating that thinking with real users may not only be an order of magnitude quicker and less expensive than building software, it avoids the huge waste of developing robust, performant, tested software that does not address the real problem. Software and hardware will still need to be built, but continuously using discovery activities to understand and address customer problems reduces the risk of building a great solution to the wrong problems. If customer and user problems and the solutions are emergent, how can you effectively manage the work of a development team (or teams)? How do you decide what gets released to customers, and when? Effective product managers decide what discovery and development tasks are the highest priority to work on at any point in time. They pay great attention to the “product backlog” – the set of problems waiting to be worked on, ideas waiting to be tested, and validated ideas waiting to be turned into production software. They may visualise these using story maps, or as items on a Kanban board. This is not “project management”, seeking to most efficiently have all the tasks completed on time and within budget. Rather, the product manager is making value-based decisions about which tasks or stories (feature sets) are the most valuable to do now, and which can be deferred (and might never be done if sufficient value can be delivered to customers and the business without them). Which stories deliver the most value to customers and end users? Which stories help the company achieve its objectives (revenue, customer acquisition, or other outcomes)? Which activities must be prioritised for the product development process to be successful (for instance, prioritising a discovery or validation activity that may change the overall shape of the product)? Which essential dependencies must be built for more valuable stories to work? This may be an agile mantra, but it remains valid. It’s tempting to hold off putting your product into customers hands until it is “complete”. This is especially the case for established companies who worry about reputational risk. Delaying until the product or service is largely “complete” misses the opportunity to learn how customers choose to use your product or service. They may pay no attention to that wonderful feature you slaved over and be thrilled by other functions. You may discover that the value you expected just isn’t there, and that you need to “pivot” to a different approach. Far better to do this early than wait until the entire budget is spent. For organisations worried about reputational risk, limited pilots are a useful tool, whether with a subset of staff or a small group of customers. Early adopters may not fully represent your entire eventual market, but carefully chosen they can provide learning and become advocates to your broader market. We use a variety of tools and techniques to support Product Managers in their role, including discovery techniques and activities, dual-track agile (a team working on discovery and a team developing prioritised stories), and flexible scope contracts that focus on value delivery in a time frame rather than a fixed set of requirements.